Godot is all about a different approach to rendering, trying to accommodate better to most users’ needs. The team behind the tool shared a document that explains the overall design of Godot. This might be a starting point for developers who would like to help the team write rendering code. You can also ask the team about anything if you need something to be explained further. 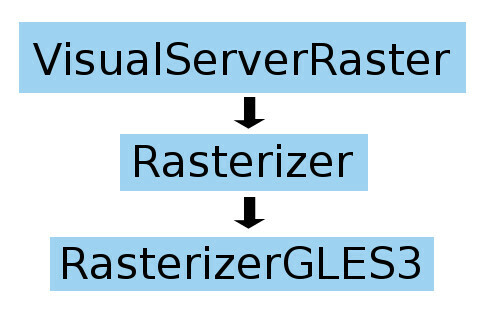 The default VisualServer implementation in Godot is VisualServerRaster, which is a Visual Server designed for rastering. This implementation handles spatial indexing of objects and, every frame, building a render list of objects drawn. It also handles the pairing of objects (lights to geometry, GI to geometry and lights, etc). Rastering is done via another opaque interface, Rasterizer, which in Godot 3.0, was further optimized to take batches of objects instead of having to call one by one to render (which hurts performance). Godot’s rasterizer implementation is also considerably high level. We know it would probably be easier to just abstract a low level drawing API like OpenGL or Direct3D (or use open APIs, such as BGFX). However, this makes our work more complex in the long run. On GLES3+ we can use UBOs to optimize shader parameters. On GLES2, regular uniforms are used. On GLES3+ we can use VAOs to optimize array configuration. On GLES2 regular glVertexAttribPointer must be used. On GLES3, we can use cool rendering techniques like Clustered or Single Pass Forward. On GLES2, for peformance, only multipass forward makes much sense. On GLES3+ we can use transform feedback for particles or blend shapes, while on GLES2 everything needs to be done using CPU. Make sure to read the full guide here.